I’ve had some great conversations lately in regards to my running, all prompted by yoga students or coaching clients. They hold a common thread and I’m sharing them because the message behind them is so worth discussion. Upon sharing this conversation with Phil, he laughed out loud and held his sides and said “You know the answer to that question is no, right?” Insert heavy sigh here. Was it ever fun? It’s really difficult to consider the answer to that question in hindsight. But it’s worth it. For anyone of us that have trained, pushed, planned, strategized, DNF’d, cried, laughed, fell down and gotten up – was it ever fun? Did I choose a sport that would ultimately shape me, then break me and stick with it because of pride? Did I keep tackling more mileage for the joy of the mileage or the satisfaction of conquering something? Or did I pick something that gave me a feeling that I loved? I guess I’m answering a question with more questions, but the honest truth is that the running itself is not what I fell in love with. I fell in love with being outside, running in the dark and feeling invisible and fast, running with friends and laughing until I cried, the taste of Starbucks after 15 miles, the natural high that came, the adrenaline that would seem to travel up and down the length of my spine. But I don’t know that it was the running itself that I loved. Maybe that’s why it has slipped away so easily, why I’ve been willing to let it go without a great sense of regret. I’m now studying a form of yoga that I love, that brings me a deep sense of peace and calm. Ironically, it’s a method that calls for practicing the same series of movements each day. Every day. OK, six days a week. Student #2 was kind enough to point out that this method fit my runner’s brain, as the poses become more challenging as your strength grows. Some might liken it to the challenge of going from five miles to 26.2 – there’s always something more to strive for. So how do I balance the personality that always sought a new finish line with the desire for a more zen-like mind? 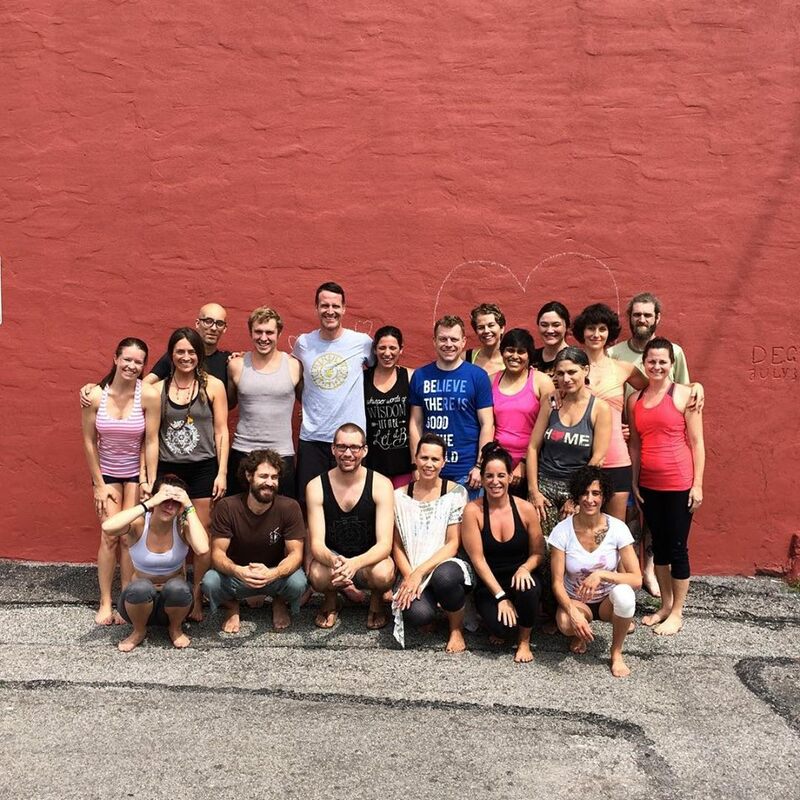 Last weekend I gave myself the gift of two days of practicing with Columbus-based Ashtanga teacher Taylor Hunt. The learning was great and part of Hunt’s personality feels familiar – like “Oh yes, you’re also from Ohio and therefore we are of the same tribe.” A few of Hunt’s pearls of wisdom stuck with me and connected directly to the conversations I shared above. I’m paraphrasing, but they went something like……. #1: It’s gotta be fun. If you’re not having fun, then you won’t keep going. Show up everyday and see what your practice has to teach you. #2: Show up every day at 80% effort. Better that than 150% on Day 1, 50% on Day 2, 30% on Day 3 and not showing up at all on Day 4. Did you shake your head a little just now? Feel a little sense of disagreement? Then perhaps you’re a bit like me. 80%? I was a teacher for God’s sake. 80% is a B-! Who wants a B- in life? I’m supposed to show up at a B- level every day? Yes. The zen-seeking element of me needs to let go of the desire to be high achieving. I need to let go of the part of me that is attached to outcomes. There’s no Garmin in yoga class. No timer. No lap counter. No mileage for me to track. No prize. So, here’s my question for you – has it ever been fun for you? Are you doing something that you love every day? Or are you slugging to the gym/box/studio/trail because it’s become automatic? Because you have a race/goal/prize in your line of vision? Have you ever hit a wall with your wellness or fitness practices and realized that you had stopped having fun? I’d love to hear about it.